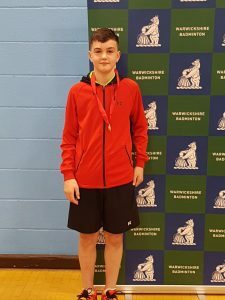 Tony Becket, recently entered the Warwickshire U17 Bronze, a Badminton England tournament on Saturday 3 November 2018. Following in his own words how he won a Bronze in the Mens Singles. I played very well and managed to get a bronze medal. I got out of my box comfortably with scores such as 21-9 21-10 21-15 and 21-11. Then I got to the quarter final and won comfortably against an opponent I had lost to before 21-13 this was the game I was particularly pleased with. In the Semi-Final I played the number one seed and the overall winner of the tournament. I did lose this game but I played well and never gave up. The end score was 13-21. I really enjoyed this tournament and was pleased with my result, especially as I played a higher aged tournament.